Before starting your Thematic Activity, you want to make sure that you have gathered all necessary resources so that you are well prepared in advance. You will need a way to display videos and photos to your group (Smart Board, projector, etc.). Books and media can be obtained from your local library. Feel free to add intergenerational resources to your event to offer the chance for generations to share in the fun. There are many videos available on YouTube for your Hawaiian Luau theme. 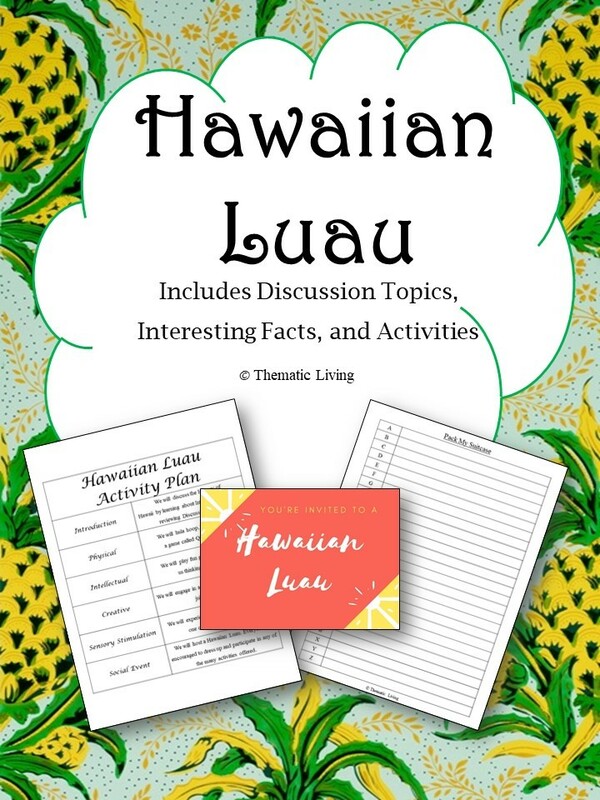 Decorate your bulletin board to follow the Hawaiian Luau theme – Be creative and use real items to add a 3D effect to your board, such as: grass skirt, coconut tops, old volleyball net, surf boards, tiki man, etc. In addition to decorating your bulletin boards, you can post a fun fact each day: For example, the title/heading of the board could be “Did You Know?”; Hawaii is home to approximately one-third of all endangered species in the United States; Hawaiians eat 6 million cans of Spam a year; etc. Using an oversized map or globe to pinpoint Hawaii/Polynesia can serve as a visual aid.